Layers of embroidered lace appliqués cascade over a layer of allover lace in this luxe A-line wedding gown. Featuring an illusion V-neck and V-back trimmed with beading, the bodice is lined with organza and sheer to the waist. A scalloped hemline and accents of shimmering beads, pearls, and sequins evoke opulent glamour. Finished with crystal buttons and zipper closure. I wore this dress once at my wedding on August 26, 2017. I bought it brand new and it is in its dress bag, in excellent condition. The beading/pearl work is very delicate so there are a few imperfections that are hardly noticeable. It's a size 2 but seems closer to street size 4. It is such a special dress with its light champagne color. 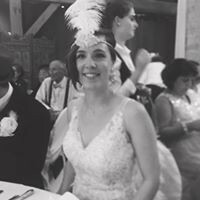 It was perfect for my Gatsby/1920's vintage theme wedding! I felt very comfortable while standing, seating or dancing. I added a bustle for optimum comfort while dancing. My height is 5”2” and I wore 3” heels at the wedding. I did alterations to fit my height (hemmed), and I had a custom bustle made. Bra cups can be added. Mid-size veil available for no extra charge (sale price: $100). Once you send a message, Aivan can invite you to purchase the dress.